What I like a lot about Barcelona is that you can still find so much tradition among a modern lifestyle. For example, next to a trendy designer boutique you can find a shoe store where your grandfather would love to buy his shoes. And you will see lots of small butchers, bakeries and delicatessen stores where it’s very normal for the people from the neighbourhood to get their daily groceries, even in the city center. Xurreria Banys Nous is one of these typical shops you will pass by in the middle of the busy neighbourhood el Gotico. This place sells the best churros I have tried in Barcelona. They are nice and crispy, but still a bit soft on the inside. If you stay in the shop for a while you see so many different kinds of people getting their daily portion of churros. You can have churros for breakfast or at teatime. So in the morning you have people dressed up for work getting their churros to take to the office. Then of course you have the Japanese tourist who wants to try the best churros in town. 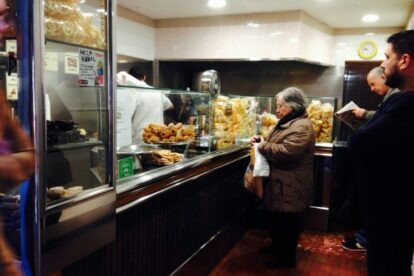 And in the afternoon you also have the sweet grandmother who just picked her grandchild up from school, buys fresh fried churros to take home where she will prepare a nice cup of hot chocolate to have with it.